Many industries with high temperature operations that emit hot, dirty gases via large ducts or stacks require accurate flow measurement to report regulatory compliance. These flue or stack gases pose special challenges for single-point air/gas flow measurement sensing technologies because of their multi-gas composition, swirling air currents caused by changes in demand, high temperature or humidity extremes that vary seasonally and often the emission of sticky or abrasive particulates. With its smart digital flow transmitter and advanced thermal dispersion technology flow-sensing elements, the MT91 Flow Meter meets federal environmental requirements for CEMS per CFR Title 40, Part 75. The MT91 is an excellent choice for measuring mass flow almost anywhere variable conditions limit single-point flow meter effectiveness. Harsh environments, in which temperature, vibration, abrasion and corrosion pose difficulties for other meters, are no problem for the rugged MT Series multi-point flow meters from FCI. 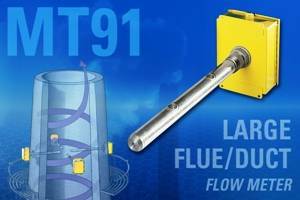 The MT91 Flow Meter features a unique multi-point averaging thermal mass flow sensor design. The MT91’s design combines FCI’s highly reliable thermal dispersion, no-moving parts flow element design with up to 16 flow sensing points while operating over a wide temperature range up to 454° C.
The MT91 Flow Meter’s fully temperature-compensated flow sensor electronics are highly stable with almost no drift for excellent accuracy and repeatability. The highly versatile MT91 features a wide turndown range available from 5:1 to 100:1 with a flow range from 0,08 NMPS to 46 NMPS. Up to four meters can be installed to measure air/gas in the largest of stacks. Measurement repeatability is ±0.5 percent of reading. FCI’s advanced flow sensing element design, based on thermal dispersion technology, measures air or gas mass flow with exceptional accuracy and repeatability over a wide range of temperatures and environmental conditions. Each all-metal flow element features a fouling immune no-moving-parts design for simple maintenance and long life. The flow element incorporates two platinum resistance-temperature detectors (RTDs) for temperature and flow measurement. All wetted surfaces are 316 stainless steel with nickel brazed joints per AMS 4777 (standard) or Hastelloy C-276 as an option. Coating materials, such as electroless nickel plating or chromium carbide are also available. The 316L stainless steel sensor assembly is available with flanged, threaded and retractable process connections with an IP66 rated (NEMA/CSA Type 4X) junction box and installed at the desired location with a choice of popular process connections. The flow element assembly is connected remotely by cable to the electronics package up to 304 m away. Dual 4-20mA analog outputs of flow rate and temperature and dual DPDT relays are standard outputs for easy user interface with DCS, PLC, SCADA, controllers or other recording devices. The MT91 offers a smart flow transmitter with a powerful microprocessor-driven design for superior signal processing and data collection. This design includes a user-friendly menu-driven interface with a large LCD display and keypad for programming the control, monitoring, display and driver/alarm functions. A nonvolatile EEPROM chip stores applications and calibration data, and protects this data in the event of a power disturbance. Furthermore, the MT91 runs daily operation and integrity checks and reports its findings to the plant operator to ensure continuous proper operation.